Breadcrumbs and cauliflower are a classic, comforting duo. In this nourishing and substantial side dish, pecans and lots of parsley add a major yum factor to the crumb topping. Photos by Hannah Kaminsky of Bittersweet blog. Tear the bread into a few pieces and place in a food processor along with the pecans, parsley (make sure rinsed parsley is completely dry before adding), and paprika. Pulse on and off until the entire mixture is reduced to even, coarse crumbs. 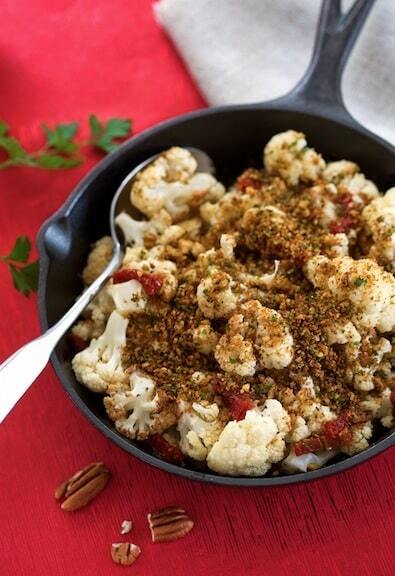 Place the cauliflower florets in a skillet with just enough water to keep the bottom moist. Cover and steam over medium heat until tender-crisp. Drizzle in the oil, stir, and raise the heat to medium high. Cook, stirring frequently for 2 to 3 minutes longer, or until the caulflower is touched here and there with light brown spots. Remove from the heat and stir in the dried tomatoes if using them. Season with salt and pepper. 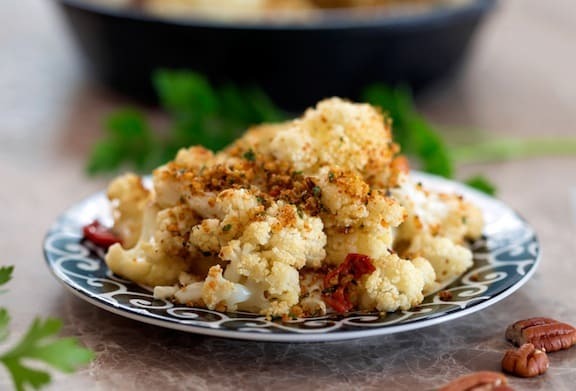 You can either transfer to a serving dish and sprinkle evenly with the crumbs, or sprinkle the crumbs over the cauliflower in the pan and serve. where do the sun dried tomatoes go? Laura, thanks for your eagle eye. I made the fix. There were a couple of other clarifications to be made and those have been added as well.